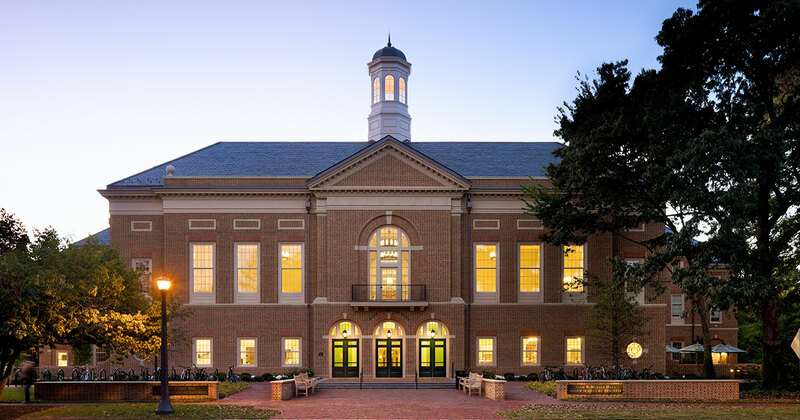 Trading uniforms for suits and heels, members of the military flock to the brick walkways and sunlit halls of Raymond A. Mason School of Business at William & Mary. Military personnel from across the country make Williamsburg their temporary home as they undertake a new endeavor. Twenty percent of students in the full-time MBA program are active-duty military members or veterans. Multiple students with military connections also span the business school's other degree programs. Navy Lt. Clarissa Butler said that after eight years in the military, the transition to William & Mary brought about a little culture shock. The more relaxed student-professor and cohort interactions were a change of pace during her transition from active duty to reservist. Army Capt. Myles Durkin, also a MGJW Fellow, explained that it took some time to transition from military "speak" to the commonly used vernacular in the business school. But while the Mason School programs are arduous, he and other students with military backgrounds cite their experience in the services as helping them meet that challenge. From time management to maintaining perspective, their military backgrounds serve them well. Within the program, they are known as hard workers with logical and succinct ways of thinking and communicating. Many of Mason School's military students have interacted with people from diverse backgrounds and cultures throughout their careers. They appreciate the opportunity to study and engage with like-minded individuals at the Mason School. When asked about their favorite parts of the program, Staub and Hall mentioned how much they enjoyed the cultural and professional diversity of other students in their cohort. The Class of 2019 is forty percent international and brings not only a global perspective, but insight and experiences that would not necessarily be present in a less diverse class.